With PPA's See The Difference toolbox, you'll find tools, resources, tips and examples to help photographers work on marketing, branding, and sales! These tools include everything from enlightening videos to photo-style quizzes that are fun and informative for photography consumers and prospects alike. The variety of resources you'll find is to help you show potential clients why hiring a professional photographer is smarter and more cost effective than hiring an amateur. It's all about upping the value of your offering and positioning so you can stand out from the crowd. PPA continuously adds new tools for PPA member to easily add to their marketing collateral pieces, website, social media, sales presentation, etc. This month you will find a brand new resource to further enforce that concept. In this effort, a contest was held on theLoop (PPA's members-only social network) to find some fun images that may remind you a bit of your childhood ventures into Highlights magazine. 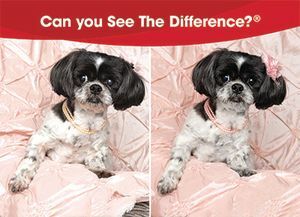 The idea is for your potential clients to see two side-by-side photos, and see if they can pick out all the differences between a photography snapshot and a professional portrait. Studies have proven that games like this one, as simple as it may seem, help people integrate concepts in a deeper and faster way. As the saying goes, a picture (or two, in this case!) is worth a thousand words. Simply put: let them play a little and they will see the difference between a pro and an amateur shot. You will find one spot-the-difference postcard for each photography specialty: Wedding, Family, Newborn, Seniors, and Pets. Simply print out, and keep them in your studio or share them on your website. Your potential clients will find themselves enjoying a little puzzle, while also learning the talents that a professional has to create beautiful photos. Use this or one of the many other See The Difference resources to help market your brand and sell your services and products. It's just one of the many ways that being a member of PPA can help you Be More. If you're not a PPA member, check out all the benefits you could be receiving and then join today! Lisa Sharer is the Marketing Campaign Manager at Professional Photographers of America. As a Creative Writing graduate, she loves any chance at getting pen to paper. When she's not being creative in the workplace, she can be found skating with the Atlanta Rollergirls or volunteering with the Weloveatl Project. Or really - snuggling with the dogs.